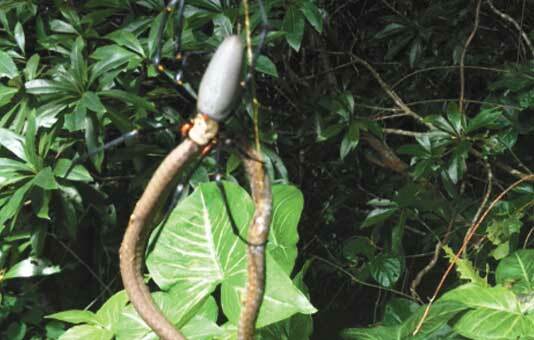 Incredible photos: A frighteningly large neighbourhood spider captured eating a tree snake. LOCAL man, Ant Hadleigh, was lucky to have his camera on him when he stumbled across this golden orb weaver spider in a slow attempt to devour a live snake. “I thought it was pretty incredible,” Mr Hadleigh told The Cairns Post. The extraordinary images, courtesy of Mr Hadleigh and The Cairns Post, capture the giant spider undertaking the mammoth task of consuming the still living brown tree snake caught in it’s web. “A few times the snake managed to get up and attack the spider, and the spider would run back up the web, ” Mr Hadleigh said. Mr Hadleigh spotted the spider in a mate’s backyard in Cairns, Far North Queensland. The pair watched on as the snake fought for well over an hour to free itself from the tangle of the spider’s web before it eventually fell victim to its antagonist’s lethal venom.